"We only wish we could visit more often"
"Kim - Thank you so much for the great service we received while in Steamboat. You are truly a unique type of person who puts so much care into every aspect of our experience" Pat, Austin, Carl & Mary. Bethesda, MD. Terraces S31, March 2009. “Take the lug out of Luggage”…. Condos in Steamboat recommends High Country Shipping to help you have the best vacation from the start. Ship your luggage to insure its on time arrival. Avoid airline delays and baggage fees…..Due to increased airline security and weight restrictions it is difficult to fly with luggage safely and on-time to your destination. In addition to lost or delayed luggage there is the inconvenience of dragging gear through airports, paying baggage fees and then packing it into rental vehicles. High Country Shipping is a Fed-Ex shipper with the same prices as neighborhood shipping stores. • High Country Shipping (HCS) arranges for the hassle-free shipment of the vacation traveler’s luggage/skis to and from their destination. • HCS’ provides answers all shipping related questions. • HCS sends Fed Ex shipping labels in advance, arranges for luggage pick-up at your home and then monitors the progress of luggage until it arrives in Steamboat. • An email is sent when luggage arrives. • HSC then delivers and picks-up luggage seven-days a week at any location through its local Steamboat luggage concierge. Due to increased airline security, weight and size restrictions it has become increasingly difficult and expensive to fly with luggage. That is why we have partnered with High Country Shipping. They can take the hassle out of traveling with your bags. Make sure all your gear arrives so you can enjoy your vacation to the fullest! OPTION 1: Hassle-free service and guaranteed shipping with High Country Shipping. High Country Shipping sends Federal Express luggage shipping labels in advance, arranges for pick-up from your home and monitors its progress until it arrives at your destination before you. An email is sent when your luggage arrives in Steamboat. Your luggage is then kept safely at HCS’ storage facility until the day of your arrival and then delivered to your check-in location. At your request, on the day of your departure, High Country Shipping will arrange for the return shipment of your luggage. High Country Shipping’s luggage delivery service is provided seven days a week through its on-site Steamboat luggage concierge. OPTION 2: Arrange shipping services on your own with your UPS or FedEx account to be delivered to High Country Shipping’s secure storage facility. 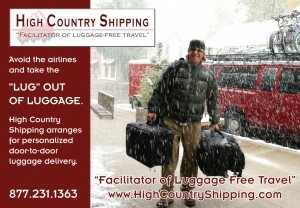 High Country Shipping will store your luggage and deliver it to your check-in facility on the day of your arrival. High Country Shipping works directly with clients from the time they call to ensure each shipment goes smoothly. They have a proven track record for over 5 years of quality service. High Country Shipping keeps its clients informed every step of the way. What could be easier?